Periodontal disease improvement shown to be good for your heart - first time ever shown! Improving your gum health has now been shown, for the first time, to be benefical in increasing arterial elasticity. That means that there is very clear evidence, not only that gum disease is bad for your heart but that when you do something to improve your gum disease, your heart will benefit! The study in the Australian Dental Journal 2016 looked at patients with moderate to severe periodontal disease. The patients who showed an improvement in their periodontal health also showed indicators that their bodies reaction to the gum inflammation was lessened and this leads to an increase in blood vessel elasticity - so heart health is better. For more details check out the article online. Gingivitis is inflammation of the gingivae (gums). Gum disease (also called periodontal disease) is an infection of the tissues surrounding and supporting the teeth. Gum disease is a major cause of tooth loss in adults. Because it is usually painless many people do are not aware that they have gum disease. In the general population of Australia about 10% have advanced or severe gum disease, 80% have mild to moderate disease and 10 % have no gum disease. Gum disease is caused by plaque, a sticky film of bacteria that constantly forms on the teeth. Bacteria creates toxins that both damage the gums and result in a reaction by the body which results in loss of bone and supporting tissue of the teeth. Gum disease is still subject to intense research. Scientists are looking at ways to kill off the offending bacteria and how to make the bodies reactions to the toxins less severe. For acute infections sometimes dentists will recommend chlorhexidine mouthwash or an antibiotic. Any defective restorations or those that trap plaque may need to be changed so you CAN clean. You might not be able to tell! It can be very slow or may cause you no obvious complaints. MYTH: Bleed gums are caused by brushing. Bleeding gums are not normal and the cause should be investigated by a dentist. Bleeding is an early sign of periodontitis but may not result in any further problems. However, it is usually also present where the disease has started to cause loss of bone around the teeth, with development of "pockets" where the gum becomes detached from the tooth and areas of plaque and food accumulation occur, which in turn cause further problems. Other conditions can cause bleeding gums. Plaque is a build up of bacteria and other microorganisms, dead cells, and a bit of left over food. Scrape your fingernail over your tooth and the whitish film that you collect is plaque. The inside of the mouth is a cosmopolitan village of bacteria and other microorganisms that we can't permanently remove. Experiments have shown that one hour after cleaning up to one million bacteria can be recovered from a tooth surface! A diet of refined foods tends to result in a greater build up of less desirable bacteria on the teeth. Calculus is something studied in higher mathematics and tartar is something said by babies when they wave good-bye! No. Try again. Calculus (or tartar) is plaque which has been hardened by minerals. The amount of calculus that forms around the teeth is determined by the cleanliness of the teeth and the amount and types of minerals in the saliva and being released around the teeth. A periodontal pocket is the gap measured between the tooth-gum edge and the underlying bone. A pocket can be difficult to clean and is a home to bacteria and other microorganisms.This can cause bad breath. 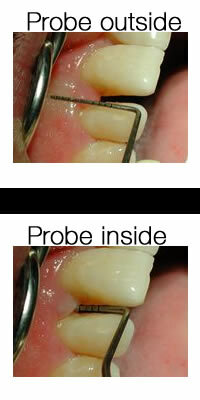 Dentists use a periodontal probe to tell if a periodontal pocket is present. This involves cleaning the root surface of the tooth to remove plaque and calculus. Cleaning calculus is done with sharp instruments called "scalers" or sometimes with an ultrasonic cleaner which vibrates off the hardened material. When the calculus and plaque is located on the tooth roots and in deep pockets its removal and the subsequent cleaning of the root surfaces is sometimes referred to as "Root planing". The treatment is similar to scaling and cleaning but usually more difficult and time consuming because it is difficult to get to deep areas. When gums are not healing well after scaling or Root planing other forms of treatment may be required. Your dental health professional will discuss these with you. A lot of recent research has looked at the link between periodontal disease and heart attacks. Heart attacks have been shown to be related to bacterial and viral infections and the mouth is now being examined closely as the source of these microorganisms. #Arch Intern Med 2000 Oct 9;160(18):2749-55. The implications of this research are that keeping your teeth and gums healthy is important to your overall health. The commonly used cholesterol lowering medication has been used in a small study to have a positive effect on gum bone height, according to a recent article published online October 2 in the Journal of Periodontology. Researchers had noted anakdotal evidence that patients on lipitor had less severe bone loss due to gum disease so they wondered if applying the medication to local areas would also help prevent bone loss in periodontal disease. In a study of 60 people using only one "site" (tooth) per mouth the researchers found signicant bone fill radiographically compared to people given a placebo. A group from the University of South Australia have reported on a review of 8 unique studies looking at the link between fish oil supplements and reducing periodontal disease. The results look promising - especially in 2 studies that used fish oil and aspirin. Fish oil is known to have anti inflammatory properties so further investigation is underway in Australia looking at the effects fish oil supplements in adults with periodontal disease. This study was presented April 24, 2012 at the Experimental Biology 2012 meeting in San Diego, CA. An earlier article within the Journal of American Dietic Association reported that dietary intake of polyusaturated fatty acids, such as in fish oil may show promise in treatment and prevention of gum disease because of the anti-inflammatory properties. 3. Dietary supplement made no difference.